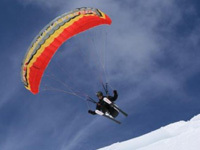 Here is the solution after the long search for a performance-strong glider, combining the capability for speed riding and speed flying - the speedfire. 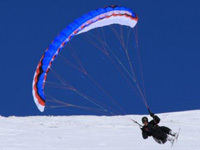 This explosive brew is distinguished by a high measure of stability and speed and guarantees fun at any altitude. In steep terrain, you can ride close to the slope at low glide ratio and find your way into the valley. Away from the slope or trail, the Speedfire guarantees the performance of an innovative flyer and pleasantly surprises with all of the fundamental flying qualities, in order to fly and land safely and with true satisfaction. Speedfire 8 pro - the answer to all of the desires of professional speedflyers: A maximum of skiing and flying experience is indispensable. Only then can the extreme fun for extreme people be guaranteed. 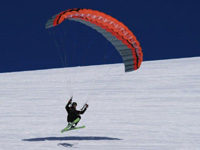 Speedfire 10 pro - fun is assured, with or without skis, in all flying situations. 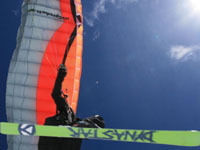 Speedfire 12 and 14 - optimally recommended for the introduction into the world of speedflying in summer and winter.